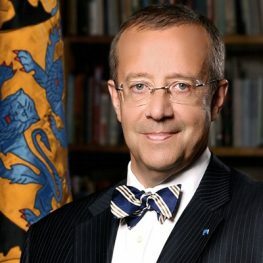 Toomas Ilves received the "Knight of Freedom" award for his activity to promote democratic and pro-European values in the country and all over the world. He was born in Sweden in a family of Estonian refugees. He completed his studies in psychology at the universities of Columbia and Pennsylvania. In the 80s he worked as a journalist for Radio Free Europe, and after the restoration of Estonia’s independence was an ambassador in the US, Canada and Mexico. In 1996-1998 for the first time he held the post of foreign minister. In 1999 Ilves received the mandate of the Riigikogu and again headed the foreign ministry, which he directed until 2002. In the first Estonian elections to the European Parliament in 2004 he obtained the mandate of MEP. In the years 2006-2016 he held the office of president of Estonia.